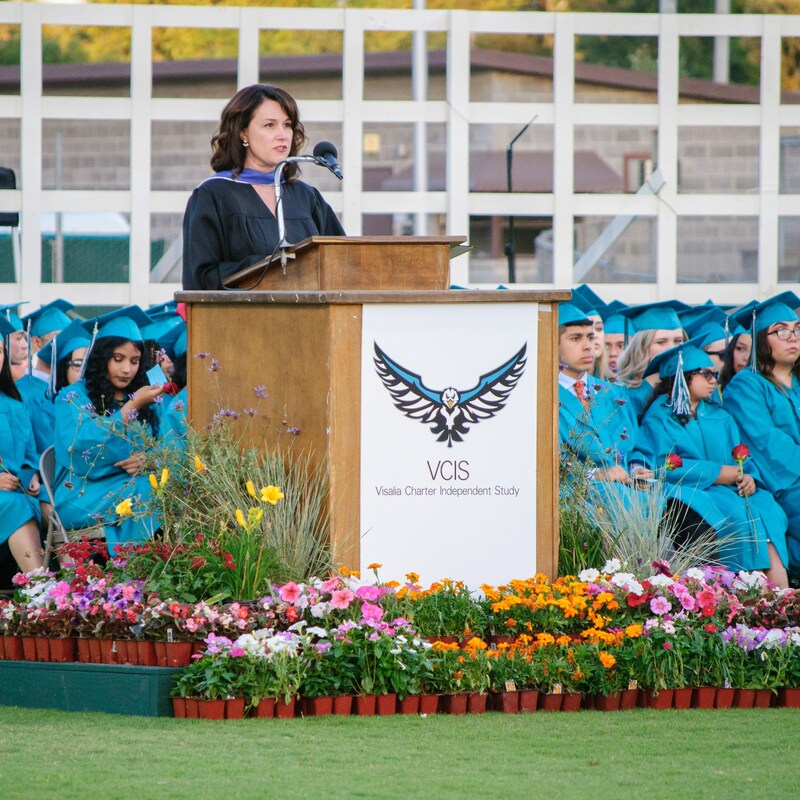 Welcome to Visalia Charter Independent High School! Charter schools, such as ours, provide an exciting opportunity for families to choose an alternative path in education. I am a strong advocate for student choice and individual options. I am confident that students who graduate from our program learn to be in control of their educational paths, and learn the mandatory study skills for success in college. We know that every child is unique and has many strengths. Our belief is that all students can succeed but in “different ways and at different times.” The structure of VCIS allows students to excel at their pace and take charge of their education! We also know that students need additional support in areas of difficulty. Every student is assigned a supervising teacher who oversees your child’s education. This allows the parent and student one consistent source of guidance, available to answer any concerns and questions along the way. VCIS has an extremely qualified, credentialed, and carefully hired staff. Our teachers are experts in reconnecting students that have become disconnected, and they know when to challenge our high-performing students in their educational pursuits. Our proof is our consistent number of graduates each year. Our program is WASC accredited, UC approved, and NCAA approved. The staff and administration are continually working together to improve curriculum and the learning process to prepare students for the competitive nature of work and college. We are a model hybrid learning school, with rigor and strong relationships with our surrounding community. We encourage COS dual enrollment and ensure our graduates have a plan of choice. Our location and continued support of Visalia Unified School District allows us to offer many more opportunities for your child. We have a 17,000 square foot facility, a separate dance studio, a competitive health science program, and an Online School! There simply isn’t a more impressive blended learning school in the entire valley! Remember, all VCIS students are expected to work independently and to make it to classes or meetings on time to be successful. There are many locations on campus to work and get help. Check out our “Resources” page to find links to our tutoring schedule. You can also visit our “Independent Study” or “Online” page for a list of classes. We look forward to a fantastic partnership with you and your child for another magnificent school year!